We were looking for the best copper fire pit that was stylish and easy to maintain this fall. We started researching all the the ones we could find. If you’re in the same boat, then hopefully this info will help you too. I’ve narrowed our search down to 3 and will share which ones we really like and why. 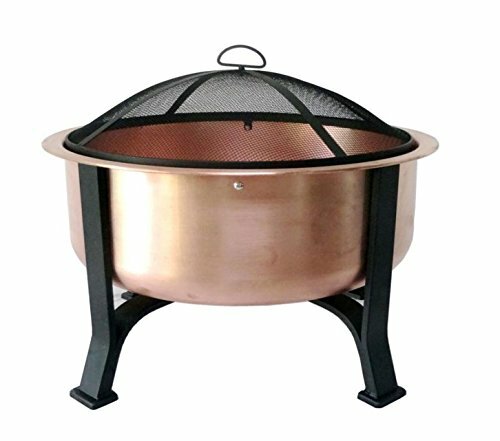 Are Copper Fire Pits Better? Will a Copper Fire Pit Rust or Tarnish? This copper fire pit is a great looking, deep bowl to handle more fire wood and bigger logs. I like this because I don’t have to keep feeding the fire. Although when you’re creating a fire, who doesn’t love messing with it. This bowl also comes with a safety poker along with the lid and a protective cover when not in use. It’s 26 inches in diameter if you need a good size for your area. It’s sleek and modern looking. This is a little different design than the Global Outdoors one, but it’s also deep bowl that can handle more firewood. This copper fire pit is 30 inches round, so a few extra inches bigger than the first one and it’s 24 inches tall in the bowl. It’s a little more ornate that I like, but it has the screen lid, safety poker and a wood grate. Technically, you could use the wood grate to put something on the fire. It doesn’t have a screen cover so keep that in mind if you really need a bowl with a protective cover already. Even though it doesn’t have a protective cover, it does come with holes pre drilled in the bottom to allow for drainage. Unlike the other two, this one is solid hammered copper, so you’ll see dents in the bowl. It’s a traditional way to showcase a copper item, so if you like that, then this would be the style for you. LARGE SIZE: Overall 30 inch diameter x 24 inches tall with screen (14.5 inches without). Base is 5 inches tall with 20 inch diameter. Weighs 30 pounds. 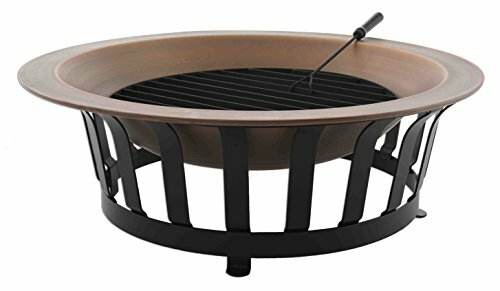 DURABLE CONSTRUCTION: Backyard fire bowl is made from 0.7 mm thick steel metal with high temperature copper finish for added resistance to rust. FULL SET INCLUDED: Outside firepit set includes a mesh spark screen, a 26 inch fire poker stick, and a built-in wood grate. All the fire tools you need to enjoy your camping or backyard bonfire. PORTABLE AND FUNCTIONAL: Copper fireplace has two holes in the bottom to allow for drainage, as well as handles on the side to make it easier to clean and bring with when traveling. 1 YEAR WARRANTY: Sunnydaze Decor backs its products with a 1-year manufacturer's warranty. SOLID COPPER: Our gorgeous fire bowl is constructed from 100% copper. With its lovely reddish-brown finish, it will add a touch of class and elegance to your backyard. Copper is not only beautiful but durable too. It is a tough metal, able to withstand high heat and harsh weather. 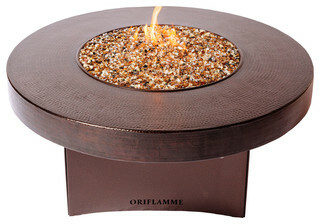 You can rest assured that this fire pit won't rust or oxidize like cheaper copper bowls. Enjoy it for years to come! STURDY GRATE: A thick steel grate is attached to the copper bowl. It is wide enough to hold logs and firewood up to 2 feet long. The grate provides excellent ventilation, keeping your fire going until each piece of wood has burned. With this fire pit, you'll have roaring fires each and every time you use it. PORTABLE: There's nothing better than sitting around the fire, telling ghost stories and roasting marshmallows. However, having to build a campfire pit each and every time can be tedious. 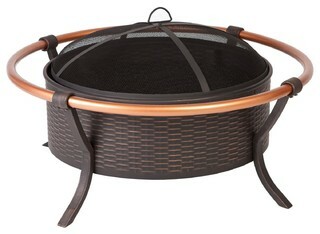 Titan Outdoors' Copper Fire Pit is a light 66 pounds, so you can bring it with you to a beach or campsite. It will also make a lovely, upscale addition to your patio, deck, or backyard. MEASUREMENTS: Our copper bowl has a diameter of 39 inches and is 8 inches deep. Altogether, the cauldron measures 14 inches in height. The steel grate is 1/4 inches thick and can hold logs up to 2 feet long. The iron base is 1/3 inches thick and is braced with a 1 and ¾-inch iron band. The fire pit weighs approximately 66 pounds. 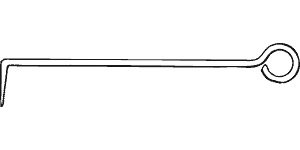 ABOUT TITAN: At Titan, we pride ourselves in our excellent communication capabilities. We are always willing to answer questions if you need to contact us. Our full-time teams work around the clock to make sure you get high-quality products and service for a wallet-friendly price. If you're not 100% satisfied with your purchase, we will provide a money-back guarantee. This is probably more like when the original copper fire pit came out. It’s 30 inches in diameter, but not as deep of a bowl. This is great is you like to keep adding firewood to the bowl or if you just want a smaller fire to handle. This one’s great because it comes with the grate, fire poker, mesh lid, and a protective cover for when you’re not using it. It weighs about 20 pounds so it isn’t too difficult to lug it around the backyard if you need to move it. They also have a 35″ diameter version that you can pick if you need a larger copper fire pit for your area. STYLISHNESS: Contemporary solid hammered copper fire pit with a 4 legged powder-coated constructed base made from wrought iron - beautiful addition to a backyard, beach, camper, vacation home or cabin. 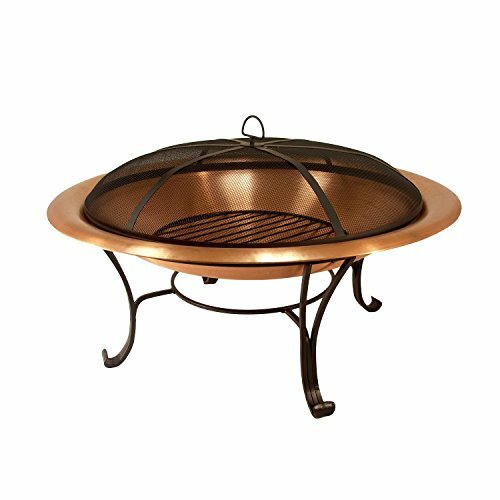 QUALITY FEATURES: Copper constructed to accommodate larger fires - 30" diameter X 12" high, weighs 20 lbs. poker, log grate, metal weaved spark screen, and storage cover included. BUILT TOUGH: Sturdy copper cauldron construction with a sturdy metal base heat resistant finish - easily maintained. 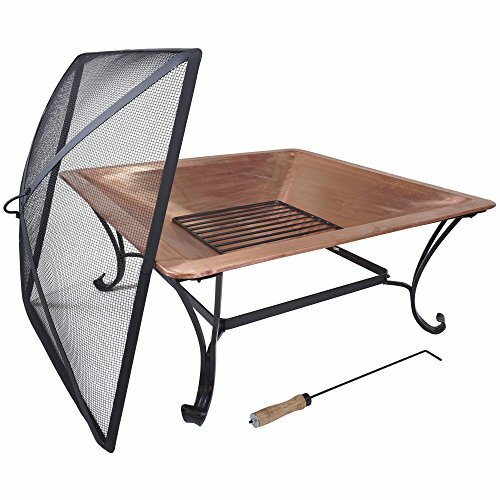 Fire pit includes mesh spark screen with a decorative handle adds both safety and beauty - screen lifting tool for safe and easy access during a fire. EASY ASSEMBLY: The fire pit easily assembles with basic tools - Catalina Creations backs its products with a 1-year manufacturer's warranty. 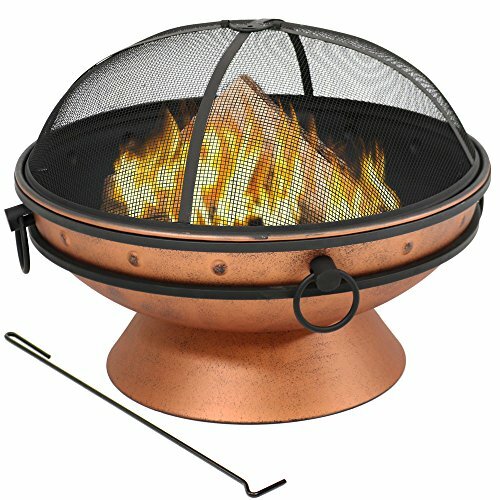 This copper fire pit is a little different from the rest with it’s square look and grate at the bottom. EASY ASSEMBLY: Owner's manual included to walk you through the 5 minute assembly! I added this one for people who like more copper accents, rather than a full on copper fire pit bowl. This fire pit is made of steel with a copper ring around it and I just thought it looked great. This is a deep bowl that comes with a mesh top and a picker. It doesn’t seem to come with a cover though, so you’ll want to look at covers to add to it. I added this one if price isn’t an object, because it’s beautiful and just a little different. Where as the others are beautiful accessories to your backyard, this would be more of a centerpiece. You could very easily add great looking chairs around this for a great gathering area at night. This is also different as it’s gas powered and doesn’t take wood like the others do so keep that in mind. Our favorite one is the first one from Global Outdoors. We just really like the clean lines and look of it. Plus it just seems more sturdy for us. So let’s discuss some of the other research that comes with getting a copper fire pit. These are main questions we asked. Let us know if you had other questions about getting one. I think we all want to know if the copper fire pit is better than, say a steel, cast iron, or brick fire pits. They all have their pros and cons. For many, the look of the copper fire pit is what’s going to make them want to buy one. They will also not rust or break. Steel and cast iron will rust, so you’ll be combating the elements with those. And a brick fire pit would be more permanent, whereas a copper fire pit can be moved where ever people are gathering. You can clean your copper fire pit either at “opening season” or after your fire pit season is over. You’d probably want to do the cleaning when the season is over so you can put it away easily. Your future self will thank you too. Clean out all the ash and debris. You can use most of the ash debris for composting if you’d like. If you don’t compost, you can still just dump it in a corner and it will be fine for your yard. Rinse it out a bit to get any extra soot out. With a scrubby, start cleaning the bowl with your scrubby to get the tarnish off the copper bowl. Bonus: If your copper fire pit has a black area, it’s a patina and you can use salt and lemons to create a chemical reaction to remove it from your bowl. Once you’ve cleaned up the area and have it looking beautiful, then you can start enjoying your copper fire pit again. This video shows someone cleaning out his copper fire pit after a season of using it. Notice he used salt and vinegar only. This will work for less dirty items. Just remember if your bowl has heavy soot or soil in the bowl, that you want a better chemical reaction with lemon and salt. Here are some of the things we were looking for in a copper fire pit and you might be the same way. We wanted something tall enough that it would be enjoyable for everyone to sit around. For the fire pit, we didn’t want it to sit too low to the ground or be too high and eye level. I know they have new fire pits for that, but for the copper style, we wanted something just a couple feet off the ground. Make sure the bowl is deep enough to handle the firewood that you put in it. Many of the older styles were more shallow and kind of felt like the fire was going to break free from the bowl at any moment. I like the kind that will be more contained. Very similar to when you go camping and you have those ring pits at the campsites. It feels like it’s going to be contained. You want a poker to go along so you can easily stoke the fire and turn logs if you need to. Usually the end will have a hook type area that will make it easier to move the logs around in the bowl. It will look something like this, but the handle is usually better for grabbing and holding. Having a cover is a nice to have item, but not super required for us. It has to handle several seasons of fires and entertainment so make sure the one you get is sturdy and won’t fall over. Again, this isn’t a requirement, but some people like to have a fire pit grate for things like cooking or oyster roast. Check out our article if you are thinking about adding a fire pit grate to your accessories. You probably noticed in the above video that the bowl has a black area and the rim seems to be tarnished. That will happen with copper fire pits. The great thing about copper is that it won’t rust, so it will last a loooooonnnnnnng time. It does develop a patina, which can be a greenish look on the rim over time. Think about the Statue of Liberty and how she has her green tint. The same thing can happen to your copper fire pit if you don’t clean it. Some people prefer the patina look. For the first time, you could let it go and see how you like it. If you don’t like the patina looks, then you can just use the salt and lemon trick to bring back the shiny copper look. This is a great question and one that we were very curious about too. If I’m going to pay a good little chunk of change on a fire pit, how long will it last? Since copper doesn’t rust, your copper fire pit could last forever. At least the bowl will. Usually the legs are a thinly powder coated steel and will probably eventually rust out. You could either replace those or create something in your backyard to put the bowl in. Similar issue with the cover. It’s usually very thin grate that will last a few seasons, but will eventually need to be replaced.